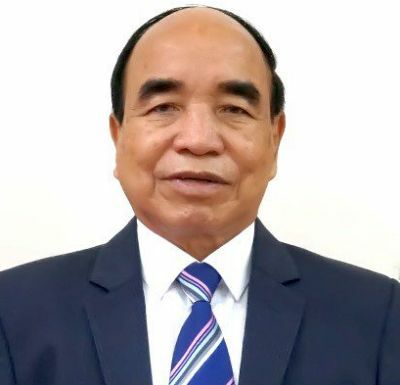 Mizo National Front president Zoramthanga would be sworn-in as the chief minister of Mizoram at the Raj Bhavan in Aizawl at 12 noon on Saturday, state protocol department officials said Wednesday. The governor also dissolved the seventh state legislative assembly during the day to pave the way for the constitution of the eighth assembly, the sources said. The protocol department officials said it was not known whether all 12 members of the council of ministers would be sworn-in on December 15. The MNF returned to power in Mizoram by bagging 26 seats of the 40-member state legislature after a decade which saw the crumbling of the last Congress bastion in the north east. This followed the newly-formed unregistered Zoram Peoples Movement securing eight seats, which is three more than the outgoing Congress. The BJP opened its account for the first time in the state by bagging a seat while the Congress managed to win five seats in the assembly polls held on November 28. Zoramthanga, who has been chief minister of Mizoram twice, was back with a bang on Tuesday after being in political wilderness for two assembly terms. The 74-year-old rebel-turned-politician was a former underground leader and a close aide of the legendary MNF leader Laldenga.